below that are some other F.A.Q.s Enjoy !! Video produced and used by kind permission of Brett Wolfe. 1. Can you loose a shiba off a lead? 3. What are they like with cats? 4. Do they need much exercise? 5. Are they a dog for first time dog owners? 6. Where can I get a shiba? 7. Are they good with children? 8. Are there any good books on shibas? 9. Is it true they are escapologists? 10. How are they with other dogs? 1. 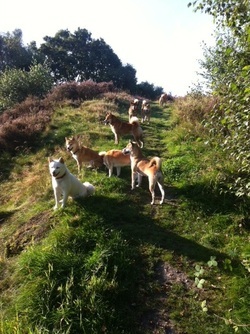 CAN YOU LOOSE A SHIBA OFF A LEAD ?